A giveaway AND a freebie? How great is that? But this is no ordinary giveaway, after all, we've got less than a week until Thanksgiving! 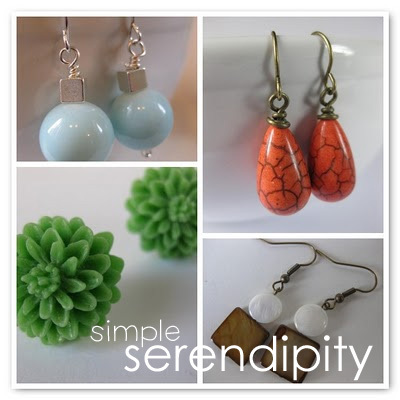 So, today we're doing a THANKFUL giveaway thanks to Sara, from the awesome etsy shop Simple Serendipity . Her great shop is full of gorgeous jewelry all under $5. A great option for Christmas, no? Seriously, go check out her shop! 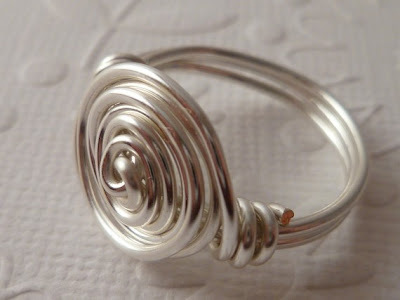 I think I'm grateful for this ring . . . Anyway, in the spirit of giving, rather than receiving, she's is giving away a $20 gift certificate to a person you're thankful for. Me? I'm thankful for my best friend Alicia. We now live across the country from each other, but somehow she is always doing nice things to keep us close. She's the best and I'm so grateful to have her in my life! 2. To give your thankful nominee a second chance, go to her shop and comment on something you wouldn't mind getting yourself-or what you think your thankful nominee would like. GIVEAWAY ENDS THURSDAY, NOVEMBER 25th. I think I will make a couple of these as Christmas presents this year. But I can't very well do spring clothes now can I? So, here are some winter clothes for us to enjoy! Click here to download. Oh, and one note, I took these pictures before I made some changes-so the one you download will be different-similar, but just different colors-like a blue princess costume instead of pink. (I'm kind of fickle . . . and lazy). If I suddenly become un-lazy and take new pictures, I'll put them up. Hello Laura! I am thankful for my Mother. I am so grateful that this teen mother put her family before herself and now gets to enjoy life with my dad and her 7grandkids 32 yrs. later. Thanks for the lace up dolls as well. I am making aprons for the little ladies in my life and this would be super cute to add in as well. I really like the Jade Ring. My mom would love anything from there. I would let her pick. Its a hard decision. how do I download the dolls. it opens the screen but I cant figure out what to click on? 2125- On the upper right hand side there is a grey row of buttons just below the blue words "printable winter lace up doll" The first button is to download. Right under the blue title there is a gray bar with the choices to download or print the dolls. I updated my previous blog posting to include these beautiful outfits, too! Ohh! I LOVE her shop! I actually already own those orange earrings! I am so thankful for my babysitter, Shelly. She is an amazing person who is family to us. Shelly would love the Simply Blue Melon! I am thankful for my mom. I appreciate her more and more all the time as I experience challenges with my own kids and realize how much she did for me and my siblings. She is frugal and healthy, fun and adventurous. She is the best grandma and does a great job of keeping in touch with her grandkids who are across the country. She rocks! I pretty much love everything in Sara's shop but especially the simple darling divas. santa? are you ready this? I am thankful for my boys. My husband-boy, my little buddy, and the one on the way. I'm thankful for my sister who is my best friend. I just moved 2,000 miles away from her and it's so hard from seeing her every day to every few months. I miss her so much. We talk every night though. 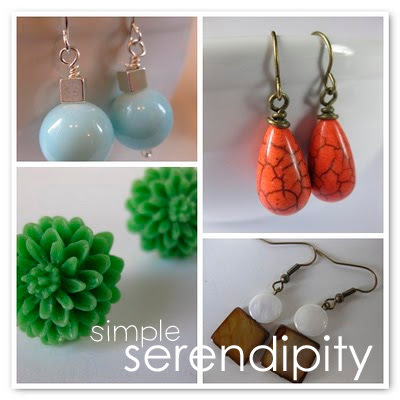 I just bought her some jewelry from Simple Serendipity for Christmas and I know she is going to love it! I really like the simple flower pendant in light purple. I'm so thankful for my best friend AMY. I love her like a sister! We met in school and have remained BFFs through births, deaths, moves, ups, downs and life. We are 1/2 a continent apart but she inspires me to better every time we talk. Amy would pick something green or yellow. I love the darling divas, I can't settle on a color. I am most thankful for my mom. She is my cheerleader, my encourager, my shoulder, and my friend. I now live in New Zealand and her in the States. I miss her very much but am so thankful for the connection we have. I like checking your crafting blog on the weekends, because I know you post your amazing freebies then. I was certainly surprised to see my name on here this week!You are so sweet Laur. I was telling Jonathan just this week how grateful I am that we are friends. Your great! I am grateful for my mommy number two in MT. She is always there for me and she is always there for my Dad. I am grateful for my kids. They take a ton of time and energy right now, and we have frustration moments, but I am so much happier right now giving them my time than I ever have been in my life. Also, I love the dolls, I'm excited to try them! Is it wrong that I wish I had these when I was a kid?! I LOVE LOVE LOVE the lace up paper dolls. Making a set for someone special and She is going to LOVE them! Thank you for sharing these! I found this site via Pinterest but Scribd says the winter lace doll outfit file has been deleted? Anyway I can download it at this point?